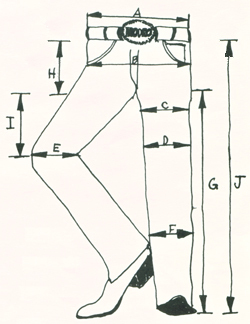 When measuring for your chaps, please use the guideline below to make sure your measurements are accurate. Enlist the help of a friend! When in doubt, add length! Don't be afraid to order a chap. We've done this bunches of times, and will walk you through the order, to ensure your satisfaction. Here is a second drawing, just in case the one above is not clear enough. 1) Waist. 2) Upper Thigh. 3) Mid Thigh. 4) Knee. 5) Calf. 6) Outseam. 7) Inseam.